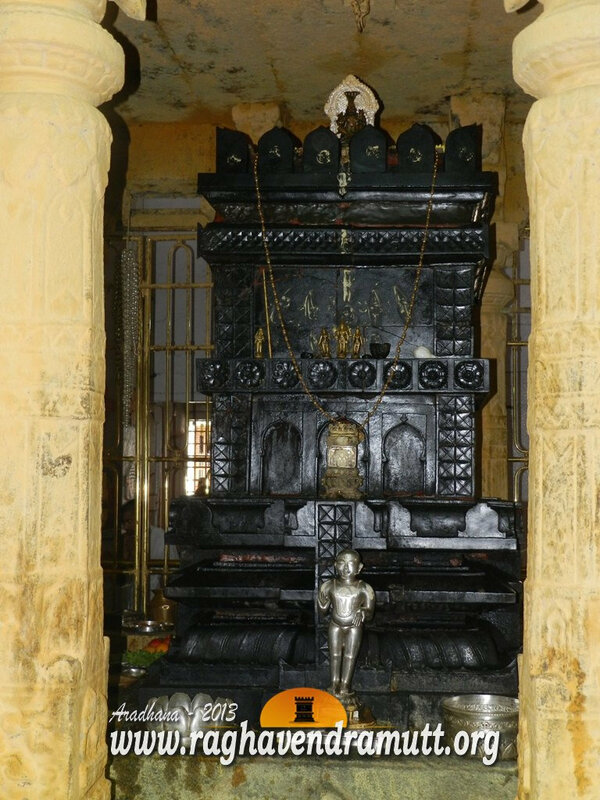 There are innumerable instances of the miracles performed by Raghavendra Swamy or Rayaru as he is more popularly known. He has been performing miracles from the Brindavana too. This is an article about the miracle that Raghavendra Swamy did when he was to touring Bijapur district. I do not know the place where this miracle took place. All I have read about it is that it took place in Bijapur district where a river was flowing nearby. This miracle is narrated by a cook who used to accompany Raghavendra Swamy everywhere during his sanchara. Needless to say, the cook was a Brahmin and he was an eye witness to this incident. The cook was one day conversing with his neighbours in Kumbakonam and during the course of the conversation he mentioned how Guru Raghavendra managed to get one of his devotees married without even bringing the bride and groom face to face. This is how the incident occurred. During one of his visits to north Karnataka, Rayaru halted at a place near Bijapur. Rayaru decided to take bath in the river and then offer pooje to the idol of Moola Rama Devaru. The rest of the followers too decided to take a dip in the river. Among them was a simpleton called Venkanna. The followers came across Venkanna’s father and asked him why Venkanna was still not married. Venkanna’s father replied that his son was mentally unsound and that nobody would gave their daughter in marriage to such a person. Some of the followers found that Venkanna was not in his right senses and that he was prone to talking nonsense incessantly. That day, Venkanna got an idea that he should marry. He then began broaching the topic of his marriage with the rest of the group. Several members on the group made fun of Venkanna while some humiliated him. When Venkanna was told that there was nobody to give their daughter in marriage to him, he approached the Brahmin cook and sought his help. The cook told his listeners that he too made fun of Venkanna. “When you do not have any money to survive, who ill give you a bride?, he asked. Venkanna did not know what to do and he innocently asked the cook to tell him the next course of action. The cook really did not have any answer and tried to wriggle out of the problem by asking Venkanna to approach Guru Raghavendra for help. “Go to Guru Raghavendra and pose your problem to him”, the cook told Venkanna. The answer did not fully satisfy Venkanna and he once again asked the cook what to do if Guru Raghavendra too cannot help him. The cook was irritated by the question and asked Venkanna to approach Rayaru himself. Venkanna was so simple and pure at heart that he straightaway walked to the river where Rayaru was taking bath. He stood looking at Rayaru and then made up his mind to seek help from Rayaru. Venkanna then walked upto Rayaru and said he wanted to tell Rayaru something. Rayaru smiled and told him to go ahead. Venjanna then revealed his wish, Rayaru smiled. Venkanna appeared dissatisfied with the reaction and once again broached the topic of his marriage. Rayaru then blessed Venkanna. Rayaru then gave Venkanna the Mrithike he was holding in his hand when he had come out of the river. Venkanna was overcome with joy and reverentially put the Mrithike in a clothe and held on to it tightly. Venkanna thought that the Mrithike was very powerful and that it would help him get married. He told everybody about the Mrithike and left the group to search for a women whom he could marry. Venkanna said he would return to the group only after he married. He began walking and after some time he grew tired. He saw a house of a Brahmin and decided to sleep there itself. He saw that the house had a small balcony and he decided to make a bed for himself there. He made his bed and was about to sleep when he heard sounds coming from within the house, He could only sleep fitfully. During the dead of night, Venkanna woke up to find a huge figure standing before him. Venkanna looked at the figure with sleep in his eyes. He ignored the presence of the figure and decided to go back to sleep. The figure shouted and woke up Venkanna again. It asked him to throw away the clothe as it had some fire in it, The figure said it was not able to gain access to the house as the clothe was coming in the way. “Throw it away so that I can enter the house”, it said. Venkanna then opened the bag and found that it contained the Mrithike Rayaru had given him. As if in a trance, he took a little Mrithike in his hands and put it on the door step. The huge figure asked to be let in. “I am a demon and I have come here to eat the child that was born today”, it tells Venkanna. The demon tells Venkanna that it will give him anything if he removes the Mrithike. Venkanna asks for gold and the demon brings it. Venkanna then sprinkles Mrithike on the demon. The demon is freed of the Rakshasha dosha and obtains salvation. Venkanna then goes to sleep. The next day, when the Brahmin comes out, he sees Venkanna who tells him everything that happened . The Brahmin realizes that Venkanna has saved his child, He says his children used to die soon after his wife gave birth. Priests had informed him that some evil spirits were talking away all his new born children. Venkanna then narrated the reason for his halt. The Brahmin realised that his brother had a daughter Radhamma who was of marriageable age . He immediately decided to get Radhamma married to Venkanna. Venkanna was overjoyed and he came back to the group and informed them of the events. The cook then informed Venkanna’s father. When Rayaru was informed, he merely smiled. He once again turned to Venkanna and smiled at him. This smile and the Mrithike transformed Venkanna into a normal human being who got married and lived a normal life. This is the power of Rayaru’s Mrithike. If you believe in it, it will always be there to help you.